My flying instructor talks about his life. We all dream of better days and brighter futures. We all want to be rich, successful, and want for nothing. However, few are willing to put in the hard work required to realise the beauty of our dreams. 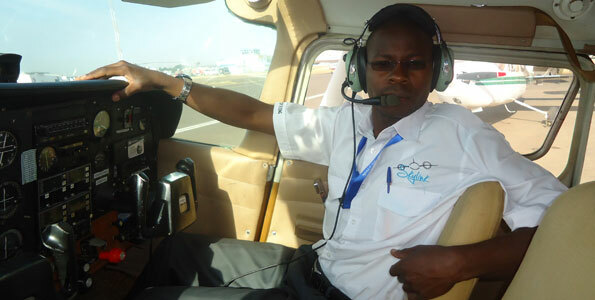 As for David Sipoche, 30, realising his dreams did not only require that he work tirelessly every day of the week, he also had to be willing to “lose face” among his peers to earn that badly needed extra shilling to become a pilot. “From when I was in primary school at Uhuru Gardens in Nairobi’s Langata area, there was something about the skies that made me dream about flying,” recalls the lastborn in a family of six children. Sipoche’s parents were civil servants who lived in Rubia Estate, Langata. As a boy, sheltered from the financial constraints of his family, he nurtured his dream of flying, convinced that all he needed to do was grow up and study hard. Eventually, reality dawned on him and he realised that his parents could not afford to raise the money required to take him to aviation school. “I thought about letting my dream die, but I felt as though this decision would cut short my life. Each day I pushed away the thought that it was impossible to become a pilot,” he says. Sipoche had a natural talent with electronics. From the time he was about 12, he could repair television sets, iron boxes, and fridges. He enjoyed doing this and would repair equipment for his neighbours at no charge. “I would read through my siblings’ high school physics books and learn a few things and then do them practically. “Electronics became my new-found love. Seeing the expression on people’s faces when I repaired an electronic item for them was enough payment for me,” he recalls. “I continued dabbling in electronics while in high school at Highway Secondary School. Each day, I learnt to repair a new gadget. “My passion for gadgets made me think that perhaps it wasn’t such a bad idea to focus on electronics and forget about my plans to fly as, after all, my family couldn’t afford the accompanying costs,” he says. “The institution was near the Moi Airbase in Eastleigh and each time army jets landed or took off, my mind was occupied with the flying idea again. So when he completed college, Sipoche decided to take up any job he could get and begin to save for aviation training. On October 28, 2004, he was hired as a waiter at Cellar restaurant and was paid Sh4,500. However, he quit after a month because of the low pay. In early 2005, he was introduced to the owner of Colnet, a company that collects garbage. He was hired as a cashier, but would occasionally have to help out with garbage collection. He earned Sh6,500 a month. He eventually realised that he would have to work two jobs. Sipoche talked to his former boss at Cellar who re-employed him. He decided that the few thousands he would earn there were better than nothing. He rededicated himself to the job, taking on any task. He soon earned himself a promotion. As supervisor, his pay rose to Sh6,500. His hard work was noticed by clients and the tips he received went a long way towards increasing his savings. For two years, he worked day and night at the restaurant and the garbage collection company, but it was all worth it as by 2007, he had managed to save Sh570,000. He was still living with his parents, which minimised his expenses. He used his savings to pay for a private pilot licence. “I decided to drop one job and chose to stay on at the restaurant. I got more promotions and eventually managed to save about Sh800,000 of the Sh1.1 million that was required to acquire a commercial pilot’s licence. “So one day I walked to where my dad was seated and showed him my private pilot’s licence. I still recall the expression on his face — he was excited and proud and anxious all at the same time,” says Sipoche with a smile. “All this time, my family was not aware that I had trained for my private licence and was in the process of acquiring a commercial one. He got his CPL in 2009 and also got flight instructor training. He later converted his licence to a Kenyan one and got a job at CMC Aviation Limited. “During my time as a flight instructor at CMC, I got talking with two of my co-workers and we realised we were passionate about making dreams come true for students who want to fly but find it difficult to pursue aviation because of a lack of finances,” says Sipoche. They came up with a plan to improve the aviation industry and make it more accessible. From the beginning of 2010, they decided to save 90 per cent of their salaries to set up an aviation school. This meant they saved about Sh250,000 a month each. They would occasionally top up the amount with money from other sources. In July 2011, Sipoche and his co-directors, Suleiman Hamud and Dilipkumar Kerai, opened the doors of Skylink Ltd. They invested Sh25 million, of which Sh20 million was from their savings. And in keeping with their initial vision, the institution allows parents to start saving early for their children’s tuition. “If your child wants to be a pilot and you have discovered that early enough, you can visit our offices and give us this information. “We will open an account where you can start saving whatever amount you want. This makes it easier for parents as they do not have to struggle too much to raise the fees once their children finish Form Four,” says Sipoche. He notes that aviation training in Kenya is expensive because of the high cost of fuel. But he hopes that Skylink’s savings facility will mean that students do not have to struggle as much as he did to reach their destination. But he warns that achieving dreams takes a lot of work. “What if I had given up midway? My fathers would never have seen the seriousness in me and supported me. Or what if I had settled for the job I had? “I don’t even think I would be a pilot now or even be a decision maker in a company. But here I am. I am living my dream. Although he is worth millions, Sipoche is humble and says he deprives his joy from seeing people settle for nothing less than what they want. And to repay the support he got from his father, Livingstone Bunyali, over the years, he is constructing a house for him. “These are among the few rewards I have in store for him,” Sipoche says. Sipoche is dating but chooses not to talk about his girlfriend. He admits that he gets quite a few advances from women who know what he does, but he has learnt to ignore distractions. “I like being honest with someone rather than lie and waste their time. It is good to be honest and outright, that way you live a debt-free life with no worries. “I occasionally take time off my busy schedule to unwind as I focus on what I plan to do next. My co-directors help and together we are able to set and achieve bigger goals for our company,” he concludes. Next Post FAITH! FAITH! FAITH! AND FAITH! Am touched by this story. Truely there is nothing imposible under the sun. I really want to be a pilot also but financial constraints have really made it imposible for me. I have lent something and God will see me through. Before i die I will fry a plane one day. Hi Joan, you so much welcome we need fearless ladies like you to go against gravity. I’ve always been so much passionate about flying.Now that i’ve done my form four i hope 2 secure a piloting school n….